McIntosh is a company-institution. Its products quickly become collectibles, and those, who use them, have a good chance, that those will outlive them in good health. Because the people working for that American company share the same philosophy, that the foundation is the most important thing: solid construction and good measurements. No mumbo-jumbo. The tested digital source, composed of the MCD1000 drive and MDA1000 DAC is not an exception. The quality of manufacture, the ideas behind the product are exceptional in every aspect. The external design may not appeal to everybody, but please do remember, that it changed little since late 60-ties, and is timeless. It is also worth noticing, that the company joined the digital group quite late. In the mid 80-ties, Gordon Gow, a big fish in Mac, discussed preparations to build a TURNTABLE. The cartridge was prepared by the Japanese specialist Mark Corporation, the tonearm was created by Bob Graham, the phonostage Ron Evans and the deck by SOTA… Not much came out of that idea, but it shows McIntosh engineers considered the CD format as immature. The first digital player carrying the McIntosh logo, the MCD7000, appeared in 1985. In 1998 the first separated system comes into existence, composed of the MDA7000 DAC and the MCD751 drive. This is the set I knew throughout – in the time it was available in Poland, I worked for the first McIntosh distributor, the company Audioholic, and this player was our reference point. In the thirteen years separating those two constructions only five new players were introduced – and none of them was a transport-DAC combo. The year 2005 was witness of another small step – the first SACD player came to the market, the MCD201. Despite the twenty four years passed since MCD7000 to MCD1000 + MDA1000, the tested system is only the second one, so technologically advanced, McIntosh offers. Thom Yorke, The Eraser, XL Records/Warner Music Japan, WPCB-10001, CD. Eva Cassidy, Imagine, Blix Street, G2-10075, CD. The Doors, L. A. Woman, Elektra/Warner Music Japan, WPCR-12721, CD. Wes Montgomery, Incredible Jazz Guitar of,,,, Riverside/JVC, VICJ-41531, K2 CD. Genesis, …Calling All Stations…, Virgin Charisma/EMI Music Japan, TOGP-15019, SACD/CD+DVD-A. The Red Michell & Harold Land Quintet, Hear Ye!!! !Hear Ye!!! !, Atlantic/Warner Music Japan, WPCR-25159, CD. Depeche Mode, Wrong, Mute, CDBONG40, SP. The Andrew Sisters, Greatest Hits, Going For A Song, GFS285, CD. The American player sounds with an incredibly coherent and self-controlled way. The discs played showed their own, sometimes different to what I was used to, faces. The acquaintances and friends, who visited me, had different opinions about it, sometimes completely different. Some said that it is “flat” and impersonal, others that it is thorough and does not color anything. Some shook their heads about its extremely balanced sound, while others pointed to the weaker extremes of the sound spectrum. Because McIntosh escapes easy evaluation. The description seems to be easy, and the characteristic points of this kind of presentation are quick to be found, but assessing this is not so simple. This is the reason I spent quite some time with the Mac, trying to sort everything out and make general conclusions. The first one is the most important: this is pedigree hi-end. This seems simple, but not for me. The second: this player sounds better with and external preamplifier (preferably a tube one) than driving the power amp directly, utilizing its built-in preamplifier. And the third: this is an incredibly “even” player, paying a certain price for this “evenness”. The American player has a very precise, brilliantly arranged sound. It seems that phase relationships are maintained with an iron fist, and nothing is happening by chance. The sound is lacking any nervousness, shaking, elements present, where there is something wrong with the time base. And this player sounds equally well with any kind of music we throw at it. And I did listen to Andrew Sisters, Depeche Mode; Genesis with Ray Wilson vocals and Thom Yorke from The Eraser. And each and every time I got a strong and clean transmission. “Clean” is an important word in this context, because it defines the work done by the constructors of this gear. And yet this is not the cleanness known from units like dCS or Esoteric, where sometimes – in my opinion – there is a lack of filling. On the other hand we do not have such saturated, colorful and somewhat “analogued” sound like with the DP-700 Accuphase, top Jadis, Reimyo CDT-777 + DAP-999EX or Wadia (eg. 27 ix). It would seem, that it is closer to the Lektor Grand SE and Lektora Prime Ancient Audio. But no – the McIntosh sounds with a slightly lower placed sound and differently put accents – with a smaller sound stage, more focused on the listening axis, favoring the direct sound of the instruments over their reflections in space (the Lektor do exact the opposite). So it will be best for me to start from the beginning. 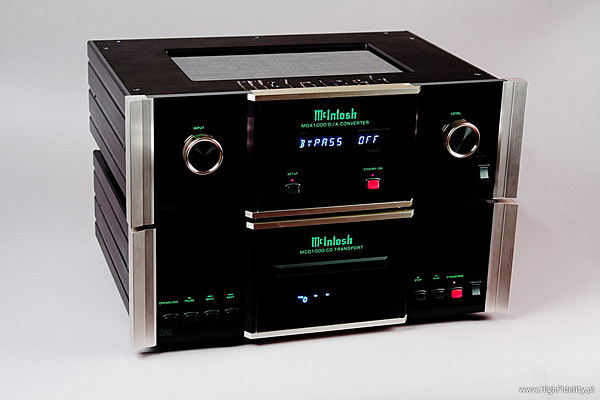 The McIntosh system has its own, easily distinguishable sound. It sounds exactly the same as the amplifying elements (solid state) proposed by that company. This is a very precise, but not bright sound, very well controlled over the whole frequency spectrum. This is not the saturated Accuphase or Jadis sound, just like I mentioned earlier, those two seem a bit colored compared to the Mac. I do not know how this is in reality; in the end I am just comparing one concept to another, with all their flaws. And not a comparison to reality. But this is how it’s audible – as if Accu and Jadis would introduce some kind of booster into the sound, something that makes it sound more like analog than coming from a digital source. McIntosh does not do anything, or at least it makes such an impression, what could be described as interference. It is a digital format and it should not make us believe, that we are listening to an LP, which has its own problems. So we get a nice picture of what was recorded on the disc. And yet the “thousand” does not underline the flaws of the recordings. This is a big achievement and only in such a case we can talk about hi-end – at least in my opinion. We should know what is wrong, but it should not obstruct music. In general turntables fulfill this assumption, and this is why those are so glorified. The Mac sounds even, but it goes deep into the recording, defining the individual instruments and planes without underlining them, or pulling them out artificially. In a short demo it may seem, that this is a slightly flat presentation, because there is not “pushing out” of the individual elements – by brightening or rounding off. Everything is in its place, but it comes from the recording itself, from the internal tension between the musicians – if this recording is of that kind – or how the tracks relate to each other, and how the sound engineer placed them together. A very even timbre follows that, but with the extremes of the sound spectrum playing a lesser part. But it is not that the McIntosh plays with the midrange only. That would be an oversimplification, we could say that about the CD-1s from Ayon, but not about the tested system. Still it is clearly audible that the upper treble and lower bass are slightly withdrawn. This is not a felony, but, I think, it comes from the desire to make the frequency response as flat as possible in the widest range possible. However listening to Lars Danielsson from Mélange Bleu (bottom end) or Hear Ye!!! !Hear Ye!!!! Red Mitchell and Harold Land (top end) I knew, that those points are slightly softened and withdrawn. Maybe this is the reason, that all what remains is so perfectly even? And not with the evenness of a steamroller or surgeon, but due to a certain “completeness. At the same time you should be careful with the upper midrange, which is a bit stronger. It is not underlined, but has a strong attack, just like the other subranges. The system does not soften anything, or soothe anything, what requires suitable environment. I would opt for naturally soft systems, without contouring, this is not needed here. Then we will get large virtual sources with a strong drawing. Only old recordings, like the mentioned Andrew Sisters, did not sound like I expected, with depth and softness, but maybe it is just recorded like this… Interesting, but new recordings sound splendid, like Depeche Mode, Genesis, Thom York or Dire Straits. First of all you hear music, and only later the flaws of the recording. Those devices can create a specific climate of “suspension” – when needed – or have drive, like on the disc L.A. Woman The Doors. I am a real fan of the commonsensical approach of McIntosh people, with their fanatic attachment to measurements and high quality workmanship, shared with another giant, the Swiss Nagra (look HERE). This is not a sound for all people; this has to be a mature decision, that this is our sound. Such sound has one advantage, it will remain equally attractive in ten, twenty, thirty and more years into the future, what can be followed easily reading the 60 year history of the company (K. Kessler, McIntosh: „…for the love of music…”, Birmington, 2006). This is also the sound, which is loved most by McIntosh followers. It is incredibly clean, without brightening and becoming clinical, while keeping the original character of the recordings. And company reputation… I am sure, that this system will be in equally good shape years from now. And this cannot be said about many audio products. Because this is an exceptional set of characteristics, but – what is common for the hi-end – not for everybody. Those who like Reimyo (HERE), Accuphase and EMM Labs should stay with their favorites. But even then it is worth to listen what the avant-garde of the competition does, as nobody is perfect. Of course cabling plays a big role in the final result. If it should be an ideal system then I would proposed Tara Labs Omega Onyx and Zero. But this would be a cost even higher than the unit itself. Is it nonsensical? I wouldn’t say that. I heard that combination, and for me those are complimentary systems. But on the more reasonable side the 0.8 series would be equally attractive. The XLO Limited silts the whole a bi, and Acrolink brightens it too much (text about the cables can be found HERE). CD Transport MCD1000 is exactly what the name states: a CD drive. Built according to the many years long tradition of the company it is extremely solid and designed to remain an attractive proposition for years to come, to survive many fashion changes. Its front is made of glass. In difference to cheaper units, the front is split into three parts, with the middle one, containing the disc tray and display, protruding. The tray has no special cover at the front, we see directly the tray itself – made from cast aluminum, and beautifully finished. The display is small and contains a track calendar – and I really do not understand why it there could be no readable, big display installed, like in the partnering DAC. The backlight above the buttons is green (classic) and the light is supplied via optic fiber, due to that the front panel does not get hot and the varnish remains intact. The sides of the panel are locked in aluminum rails. Since late 90-ties those have increased their size – the company started with flat elements, now they are almost square in cross-section. The top cover is also special – it is a thick aluminum sheet placed atop of a glass cover. There is a “window” cut in the aluminum layer, and there we see a block diagram painted on the glass below – this looks kind similar to Nagra. Closer to the front there is a large aluminum McIntosh logo placed on a gold plated plate, which gives a nice contrast to the otherwise black enclosure. The side panels are made from thick aluminum plates. On the back we see a variety of digital outputs – balanced electrical AES/EBU (XLR), two unbalanced electrical S/PDIF (RCA) and two optical S/PDIF (TOSLINK). As we can learn from the manual, the signal fed to the outputs is conform to the one on the disc – 16/44.1. Many companies have upsampling performed already in the transport. I talked to the head of the German company Audionet some time ago, who laughed at that. Being an engineer he used the acclaimed standards, and available knowledge, and this – I am talking about the theory of transmission now – states, that the higher the sampling frequency, the “bigger” the signal, the more it is prone to distortion. This is the reason, that it is better to transmit the signal in its native form and upsample it in the DAC. So we can see that McIntosh also employs engineers, who can use the knowledge available to them… Besides the mentioned outputs, we can also find ports for communication between the various Mac units and an IEC socket. Let’s add that in the top cover there is a set of small holes, visibly used for ventilation. This is interesting, because many companies, like Accuphase and also Luxman in its newest, fantastic player D-08, do everything to restrict the airflow from the outside, to protect the laser lens from external light and dust. Opening the top cover, I was incredibly curious, what kind of transport was used by McIntosh. In the former, separated flag model, they used the phenomenal TEAC VRDS, although they were not eager to disclose that information in the company materials. But because the most expensive source from the Americans does not have anything in common with SACDs, so they probably searched for the best CD only drive. And they found one – the player encloses a big, splendidly vibration isolated drive. But I was surprised what it was. It is a drive made by Linn for the Ikemi player, albeit with McIntosh modifications. And this drive was made using the read, decode and some mechanical parts from Sony. This is surprising, because the MCD1000 is a tall unit, so the VRDS-Neo drive would fit inside easily. But the new Teac drives are SACD and DVD capable, and not CD only. The Mac improvements were mostly to the mechanical isolation of the drive – the whole drive is suspended on pillars, which transfer the gravity point of the support down (and this is good). Also the frame is rigid, metal and big. Also big motors were employed for every part of the mechanism. The power supply is based on a big R-core transformer, which is characterized with the least magnetic field emission among transformers. It has four secondary windings, rectified and filtered in Rubycon Muse capacitors. The signal path is short, and we find there also a nice, thermal compensated clock. Everything looks professional and that it will last for years. But I am surprised with one thing (except the display): why the hell did they not use a proprietary link for data transfer between the MCD1000 and MDA1000, which would eliminate jitter, which is quite high in AES/EBU and S/PDIF interfaces? I2S would suffice. And yet the parent company, D&M Holding, has also the Denon brand, which has the best – in my opinion – way of transmitting signals (also DSD) between their devices, called Denon Link. But on the other hand I will remind you of the phenomenal player Reimyo CDT-777 and DAP-999EX, which uses a single S/PDIF cable, and it does not harm it a bit. The MDA1000 DAC looks similar to the MCD1000 transport. Similar, does not mean the same. The front is made of glass, it is backlit in a similar way and split in three parts. But in the middle there is no tray, but a green, big and well readable display. It displays the chosen input, output level (if we use the variable output, the toggle is available in the menu) and the sampling frequency. To the left we have a big knob for input selection (seven positions) and a volume knob to the right. There is also a setup button and a power button. In the setup we can change the name of the input (we cannot give our own names, but we can choose from a list). The top cover is similar to the one from the transport, only the block diagram is different. It shows, that there is an upsampling block after the receiver section, which upsampled the signal to 24bits/768kHz. I have seen such high values before only in Cary Audio devices, for example in the CDP1. Next we have two balanced, stereo D/A converters 24/192 per channel, then I/V conversion circuitry and finally the output amplifiers and relays. Between those there is a balanced, analog signal damper, which can be bypassed using a relay. Because the MDA1000 has a volume control. When we choose the variable output, its level can be set anywhere between 0 and 6 volts. But when we choose the “fix” option, with a fixed level, then it will be set to the standard 2V. the design is fully balanced, and the signal for the RCA outputs is de-symmetrized after the I/V conversion and led separately. There are seven inputs – three optical, three RCA electrical and one AES/EBU. There are also balanced outputs (Neutrik XLRs) and unbalanced RCA. Of course there are also the Mac communication ports and an IEC socket. The back plate is made from thick sheet metal. The insides are as beautiful as inside the drive. The circuitry is mounted on one, big PCB, placed on supports, which are also making the whole more rigid. On one side we have the input circuit, with a modern digital receiver Cirrus Logic CS8416 (which accepts sampling frequencies up to 192kHz, so I do not understand, why it was limited to 96kHz; 192kHz available for example from DSS 30 Tube Blacknote will not be accepted). Then we see a very worked out power supply, utilizing a Kitamura Kiden R-core transformer, like the one in the transport, with many secondary windings. This section contains also the upsampler. Unfortunately it is covered by a shield, so I am not sure if this is a programmable DSP or ready made solutions. But I tend to think that the first one is applied, judging from the available frequency. On the other side of the PCB are the audio circuits. In the beginning further shields cover the DAC ICs. Those are the Burr-Brown 24/192 working in parallel, just like in Accuphase. Behind those there are the OP2134 Burr-Brown visible, one for each channel, used for the I/V conversion. Then we see contactrons (switching elements, but better than relays) and big Burr-Brown PGA2310 chips – those are digital controlled, analog resistor ladders. Then two NE5532 used for filtering – those are Butterworth filters of the 3rd order – four of the same ICs are to be found in the amplifying section – and finally nice, big transistors amplifying the output signals – bipolar pairs 2SC4793+2SA1837, capable of driving reasonably sized loudspeakers. Splendid passive elements were used throughout, polypropylene capacitors from Wima and ERO, tantalum capacitors and precision resistors. All outputs are gold plated. The outputs are keyed with contactrons. In both units a small filter block, integrated with the IEC socket, was used. The player comes with a big system remote, capable of controlling all other McIntosh devices.